Experience the POWER and BENEFITS of a MASTERMIND GROUP! 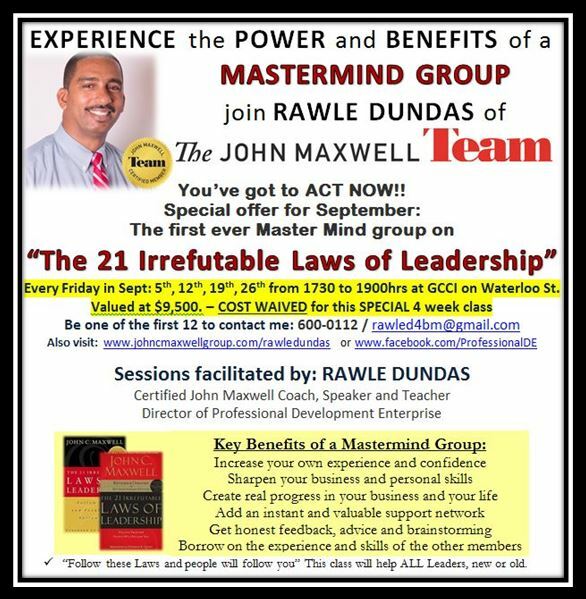 Join Rawle Dundas of the John Maxwell Team every Friday in September: 5th, 12th, 19th, 26th from 17:30 hours at the Office of the Chamber in a series of Leadership Training Sessions on “The 21 Irrefutable Laws of Leadership”. The sessions are valued at $9,500 per person but are FREE to 12 lucky persons! Contact 592-600-0112 to register now!